Happy Bloggers Challenge Friday! Thanks to those who played along with last weeks Give Thanks Challenge. This weeks challenge Button(s) - add a button or buttons to your project. My project also fits the Ribbon Carousel Challenge #87. 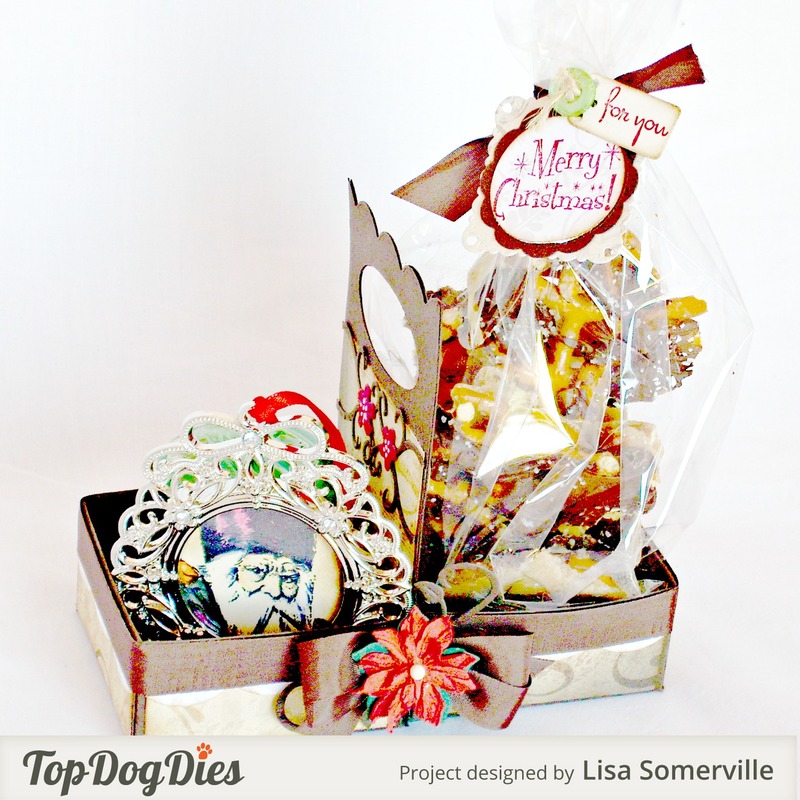 For my project, I created a gift package using stamps from North Coast Creations, Artistic Outpost and Kitchen Sink Stamps along with Dies from Top Dog Dies and pattern paper from Our Daily Bread Designs. One side of the box holds some Christmas Crack, the other side a stamped frame and small votive candle. The handled gift box holder was created using Top Dog Dies Scallop Box Die (TW013) along with the Pocket Album Dies (TW010). You'll find the tutorial below on how I used the dies to make the gift box holder. Adhere pattern paper to die cut panels. Die cut the scroll from Espresso card stock using the Leafy Flourishes Die, adhere to pattern paper and trim. To embellish my gift box, I adhered Vintage Brown Seam Binding around the top of the boxes, and added a Prima Poinsettia and die cuts flourishes using Top Dog Dies Leafy Flourishes Die Set. I added flowers to the scroll on the Pocket Album panels by die cutting the Wildflower Die from Cherry card stock and cutting the small flowers from the branch. "Merry Christmas" (North Coast Creations) and "for you" (Kitchen Sink Stamps) are stamped in Cherry Cobbler and die cut using Top Dog Dies Cherish Doilies & Tags Die Set, then layered onto a pattern paper panel that was die cut using the Darby Doily & Tags Die Set. If you'd like to play along with this weeks Bloggers Challenge, please link back to this post on your blog and mention you created your card for the Bloggers Challenge Button Challenge. Please add your link using the Link Tool below, your link should be a direct link to your Bloggers Challenge Post, use your name as the Title. Please do not link to cards that were created prior to the challenge date. Entries not linking properly, or backlinked will be removed. If you have the captcha enabled on your blog, please consider turning it off, as it makes it so much easier to leave comments. Oh, how cool is this!!! I need to get out my Die cutting machine! I love the die on the top as an accent and the gorgeous flower you added. Such a fun project! Fabulous project, and a great tutorial, thanks Lisa! What a great gift idea! Love your creative use of the different dies to make the packaging.